We hope you can take some tips from this list that will help make traveling with your pets a little safer and more comfortable. - note: many places state 'no pens' in their pet rules and regulations, but we will still set them up. If we are asked to take them down, then we comply. Or, we strike a deal that we'll set them up, put the dogs in to do their business, and take them down immediately. FYI - Only once in our whole experience of campgrounds has a site not let us put up pens. It was a KOA!!! • flashlight for nighttime pottying - RV parks are DARK! • FOOD - be sure to bring enough food for the whole trip! - You DONT want to have to try and find your dog's food in a store while traveling! Plus, many of you feed 5-star food brands which are mostly only available at specialty pet food stores. • FAVORITE TOYS! dont forget them! 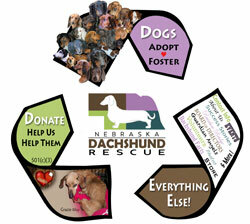 - FYI - my 7 Dachsies go through about 2 - 16oz bottles a day - Well worth the investment! - ditto the water sentiment for YOU! My coffeepot takes 3 bottles to make a 10-cup pot of coffee. - ADDENDUM - I no longer use Dasani water. It is acidic. Fiji or Evian are good alkaline choices. - snuggle bed is like a clamshell. It's so cute to see a nose peeking out. • dog crate - some really nervous travelers will need to be crated. Be sure to have lots of blankets in it for them to hide in. If your dog gets lost, it will be a tragic end to your vacation and you will be stuck somewhere looking for your dog...nevermind the heartache! - write RV park name AND lot number. Change it when you move to a new location. If you dont have time to have tags made with your current info, use one of these in the meantime. VERY IMPORTANT! • IF you get into an accident and are incapacitated, the local authorities will take your dog to the nearest shelter. Many shelters have 3-day policies. If a dog is dropped off and then not picked up after 3 days, it will be put to sleep. Some do this in even less time. • Also, in the event of an accident, your rig may be damaged to the point that your dog actually escapes before help gets there. Collars on while traveling! • Dont assume this horrible scenario will never happen to you! No one plans on getting into a terrible accident... but they happen often. • It is a very good idea to have instructions posted near your door about who to call in case of accident. Do you have someone who will come get your dogs, in the event that you are in the hospital for more than a short stay? The paramedics and police will not know your wishes if you are unconscious, and their Standard Operating Procedure will be to take your animals to the pound. • If you do not have someone who can come get your dogs, be sure to state in your instructions that you will gladly pay any kennel or boarding fees for your dogs, once you are able. ~~~~~~~~~~~~~~~~~~~~~~~~~~~~~~~~~~~~~~~~~~~~~~~~~~~~~~~~~~~~Lost Dog Posters - These should be made before you travel! • if your dog goes missing, immediately go into your RV and grab one of these PRE-MADE posters to carry while you are looking for him. • Make a basic poster with your dog's picture, name, phone number, and the word REWARD! - OR, write your dog's breed in large, heavy print. - underneath that, be sure to put your dog's size and color. Not everyone is as good at knowing dog breeds like dog-people are. That's why it's also important to put that word REWARD on it. You really want the non-dog people to keep their eyes open, too, and this incentive helps! - Use a Sharpie for the print. Dark is required for it to be legible from a distance. No ballpoints. Be sure to go to your vet at least a week before you leave. Any shot reactions can be dealt with. Dont do it the day before you leave! • Bordetella treatment (kennel cough). It is just a spray up their nose and is cheap. - Lasts for six months. Kennel cough is very contagious and many RV dog-potty-areas will carry this disease. • Shot records! Have your vet print out your dog's current shot records for you. - Immodium is ok to give to your dog (check with your vet for dosage) but we have found that Metronidazole works MUCH better! Have your vet prescribe some for your trip. You will be glad you did! - If you give them a diarrhea treatment and they have another loose stool. Give them a second dose. • If your dog is prone to bladder or ear infections or any other ailment, have your vet prescribe whatever it is you normally would treat them with. It's better to have it and not need it, than to need it and not have it. • Dont forget your Heartworm pills for the first day of the month! - I never treat my dogs with flea/tick medication unless they HAVE a pest problem. - Why? Because those meds will eliminate the pest problem in 24 hours, so why treat your dog unnecessarily with poisons that absorb into the skin? • Call the RV park and ask about the closest vet. Get the phone number. Call the vet and ask about after-hours emergencies and how you should handle them. - Do this for each area that you will be staying. - You *could* do this at check-in, but there is the chance that the check-in person may not have any information to give you. If that's the case, ask them if you can see a local phone book. • Be sure to go to your vet at least a week before you leave. Any shot reactions can be dealt with. Dont do it the day before you leave! It takes me a week to pack for the dogs! No wonder I get so stressed out before we leave. I always seem to forget something...but, practice makes perfect. And this checklist helps tremendously!